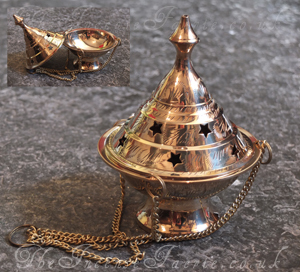 Classic, swinging brass censer with delicate etchings and star-shaped cutouts. Plenty of space for your charcoal and resins blends in the bowl, and a secure set of chains. Censer stands approx 6 inches tall (12 inches with chains extended). The bowl is approx 4 inches wide.